Sasha Hupka/News Editor Chief Timothy Faughnan will be leaving UPD after more than 35 years of service. Once his replacement is selected, he will shift to an administrative role within Binghamton University. 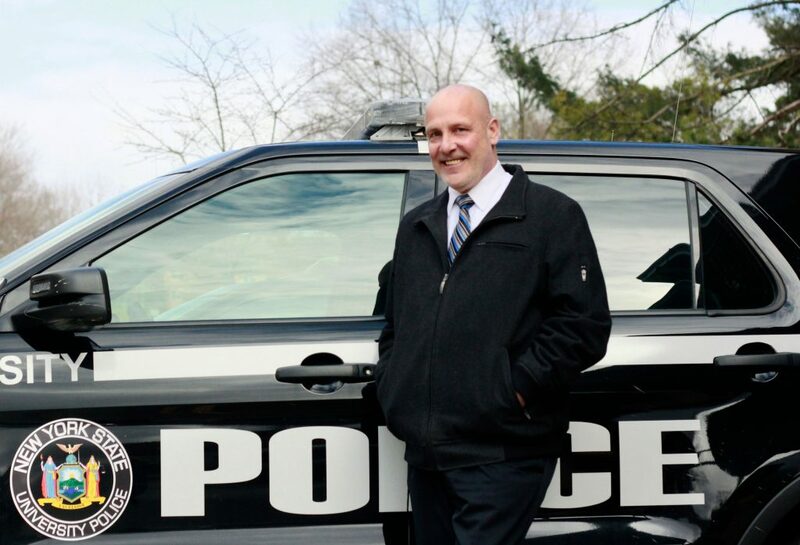 After working in Binghamton’s New York State University Police Department (UPD) for over 35 years, Chief Timothy Faughnan will be moving into an administrative role at Binghamton University, and a new chief will be coming to campus. The University has formed a search committee to find a replacement for Faughnan, composed of administrators, emergency management staff, faculty and a student representative. Brian Rose, vice president of student affairs, will chair the committee. Faughnan will serve as chief until his replacement is found. Once the vacancy is filled, Faughnan will begin his new job as associate vice president for emergency services, a new position that is tasked with overseeing emergency management services on campus and forming working relationships with outside agencies, such as the Binghamton Police Department and Vestal Fire Department. During his time at UPD, Faughnan has focused on promoting community policing, a term that refers to officers using proactive, localized strategies to solve problems as they arise. To do so, he implemented the Community Response Team, a group of officers that attends events on campus and aims to interact with students, faculty and staff as much as possible. He said he hopes his replacement will continue his work. The University’s job post for the position says candidates should have a minimum of 10 years of experience in law enforcement, including at least two years of experience in a supervisory role. Additionally, candidates must possess knowledge of police procedures and equipment, strong communication skills and familiarity with state and local laws, ordinances and regulations. Faughnan said the new chief will face several challenges, from establishing their leadership and forming relationships around campus to addressing student concerns about fair policing and discrimination. Nevertheless, Faughnan said he is confident the change in leadership will be beneficial for the department and community, and he will be there to guide the new chief as they settle into the role. “I’m looking for someone who is going to pick up where I left off and do their own great things,” Faughnan said.